French Chasseurs D'Afrique - a possible addition? 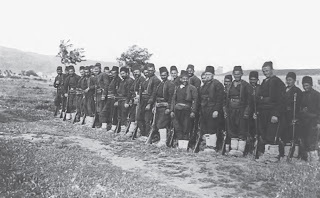 A while back I posted a number of blog entries devoted to my intentions surrounding the Balkan Wars. If you recall the plan was originally going to be the acquisition of forces for a hypothetical 1900 set for both land and sea. Events however, have moved on and so I then decided to revert to the more usual and historical 1912 variant. This is the current state of my thinking and so I am now working towards the completion of the appropriate armies for 1912. However, what passes for normality in the Crook universe is often at odds with the real world and so, unsurprisingly perhaps, I am considering my own unique twist on war of 1912. I will be including representative forces, both land and sea, for a selection of the Great Powers. I don't know why I didn't think of this before as I was certainly going to do this with the abandoned 1900 project. The plan then is quite simple and in fact looks little different to how I am tackling the project in actuality. I will get the three Balkan armies completed over the second half of the year - the Turks, Bulgarians and the Greeks - and will then add on a 'drip feed' (that is one at a time) basis those Great Powers that take my fancy. I fully intend that both land and naval aspects will be represented and the only casualty of this slight change is that I shall not be scratch building the Balkan fleets now as I already have these in 1/3000th and any new naval additions will need to be in that scale for consistency. I have already decided that any Great Power additions on the land side will be in effect Colonial type overseas service troops thereby ensuring that limited nature of their size is correctly represented - it also gives me a very good excuse to indulge in some 'exotic' troop types! For reasons that will become obvious my first foray into Great Power territory will probably be the French - simply because I shall be tackling a 1/3000th navy for them at some point. 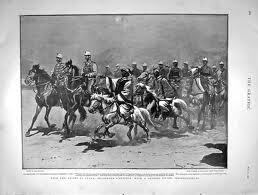 The choice of overseas troops for the French is huge and suitably exotic and will doubtless include elements of La Legion as well as any of the cavalry types including the famous Chasseurs D'Afrique. My post of yesterday (http://awargamingodyssey.blogspot.com/2011/06/portable-naval-wargame-slight-misnomer.html) perhaps needs a little clarification as to what my intentions are in respect of the size of playing area I will be using for the Portable Naval Wargame. Originally I had planned to use an 8 x 8 hexed playing area made up of my Hexon tiles. As it stands this will be OK for smallish action - certainly the first play test was fine on the 9 x 8 I used - and I will use this for such. However, for what can only loosely be described as a 'normal' sized actions (perhaps a dozen ships a side) then the playing area will need to be larger and so I shall opt for a 12 x 8. The two sizes - 9 x 8 and 12 x 8 - are made up by solely using the Hexon 6 hex tiles and so this is easier to set up (not that it is difficult by any means) in a hurry. Visually the larger size does look better with the 1/3000th models and this will certainly be the case with the larger scratch builds I shall be undertaking for the Balkan War in due course. Work on the ship lists for the Portable Naval Wargame continues apace. I have managed to format the entire document and incorporated the updated Mediterranean lists into the older DBSA version and so it now merely changing over the factors to bring the whole selection into line with my current thinking and, of course, the new rules. It has given me the opportunity to refine some of the factors in the interests of consistency and so the end product will be as up to date and as accurate as I am able to make it. I do not own many of the fleets I have listed in this fashion, in fact I have no intention of owning a couple of them, and so a number of the factors I have used will be untested. Aside from the planned nationalities I had in mind I will also look to include Spain and the major South American powers, possibly with the Scandinavian countries as well but it will depend on the data I can find. "C'est magnifique, mais ce n'est pas des jeux de guerre"
No prizes for guessing the next 1/3000th Mediterranean fleet for my collection will be then! The beavering away on the remaining ship charts continues - I have the Royal Navy, Germany, Baltic Russian, Japan and the US to complete - and should be complete over the next couple of days. I will then be uploading both the rules and the lists into Google Docs for anybody that is interested to take a look at and use should they wish. These will be very much a living document as a number of additions will be made over time but at least the core set will be in the real world. Readers may have noticed that I have put the 'Portable' of the title in brackets. This is intentional as I am no longer sure this set could be classed as portable, at least in the form I shall be using it won't be. A playing area of 8 x 8 hexes using Hexon tiles takes up a reasonable amount of space and although strictly speaking this should be classed as portable (at least in my house I have to 'port' the box of tiles and the models etc from my 'office' to the dining table!) I am not convinced that this is really the correct usage of the term. To my mind a portable wargame should be small sized and self-contained - Bob Cordery's early work on the land variant used a chess board that was the lid of the storage box for the pieces (I have a similar version myself and they are pretty easy to come by) and to my mind this is The Portable Wargame in its purest form. Aside from the obvious differences between hexes and squares the resultant set up (be it land or sea based) should ideally be in a similar fashion as the aforementioned 'boxed' version to be truly classed as portable. The ideal size for hexes for such a version on that basis would probably be around a half the size of the Hexon tile (they are 4" across the flats) and so I suspect that those included in the game Heroscape would be better. The problem here is that some models will not easily fit onto the smaller size of hex - especially if they are based. Anything pre-dreadnought would be fine in 1/3000th scale but the ideal would be 1/6000th or even 1/4800th where available. The former is very comprehensively covered but the latter is a little more erratic. I have absolutely no plans to go to the smaller scales (although I have looked at both) but in terms of fulfilling the Portable part of the title they may be a better representation of both the spirit of the title and concept of being portable. It has been a busy weekend one way or another and so I was delighted that our visit to our local boot sale was a successful one - although it was absolutely roasting and less than ideal for walking around in! I managed to acquire a couple of very useful additions for the collection - the first of which is a Bleriot monoplane from the Corgi 'History of Flight' series. This is a lovely little die-cast model scaled (I think) at around 1/100th or 15mm. I picked this up for the princely sum of £1. I had seen this in various places for around the £5 to £7 mark which I would not have paid, simply because it is very much a 'nice to have' item rather than an essential. The reason I am pleased about acquiring this is because both the Bulgarians and the Turks used these in the First Balkan War. The variant was later than Bleriot's channel crossing special and the Bulgarians also used a two seat version. The model may not be 100% accurate but it does look very nice and will add a little extra eye candy to the ground action. The planes were used primarily for reconnaissance although the Bulgarians did carry out some bombing attacks using their Bleriot two seat versions. I am not sure if any kind of national insignia was used and so if not I could easily use the model for either side. The second bargain was a pristine copy of Jeremy Black's Warfare in the 18th Century - published as one of the Cassell's 'History of Warfare' series. this is an overview of warfare in the 18th century and how it evolved from the time of Marlborough to the French Revolution. Rather refreshingly it looks at warfare across the globe and not merely from a Eurocentric perspective. 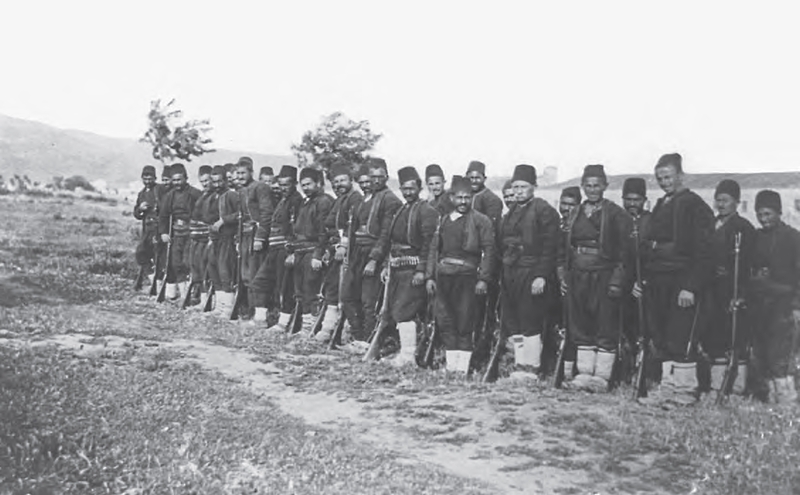 I was very interested to see the fighting in the Balkans (Austrians against the Turks), the wars in India - not just with the British and French involvement - and across the Middle East. I have a strange relationship with the 18th century - I have played some hugely enjoyable games over the years using Charge! and various other rule sets but I have never managed to stay with the period for any length of time. Perhaps I am looking at the wrong part of it and should broaden my outlook a little - if so then this book would certainly be a good place to start. After my recent playtest and the resultant revisions I decided that I needed to bring the whole thing up to a certain level in terms of coverage of nationalities. This has been a long running itch that I have finally decided to scratch! As readers of this blog will know doubt be aware, my focus has been on the Balkan navies, with a diversion into the Black Sea and the Mediterranean in general. I never got beyond those although for my DBSA variant I had managed to get ship specifications done for all the world's major navies from 1890 to 1920. With this in mind I plan to spend this weekend completing the said task - working on the basis that once it is done, it is done! I did a little painting on the ACW kit last night and have revised my intended finish date for this until the end of July which is probably a lot more realistic. I will upload the naval rules and the completed fleet lists for readers use once they are completed. It was a brief game for sure but I learned a lot from the experience and it has given me much to ponder. Inevitably there are a number of minor rule clarifications to be made but by and large it seemed to work pretty well and so I was very pleased with the outcome. I have divided this post into two sections with the first covering clarifications of existing rules and the second some potential changes. I realise that this will seem a little odd as the rules have not yet appeared anywhere but should anyone wish for a copy then please let me know and I will ping them over - after I have incorporated the changes. Ship speeds - are they too large for the playing area? Should torpedo attacks come after gunnery with gunnery damage taking immediate effect? Line of Sight - if a ship has a pair of destroyers in an adjacent hex between them and the ship firing (when checked from the centre of the firing hex to the centre of the target hex) then the line of sight is deemed to be blocked and the target may not be fired upon. The target may also not fire in the direction of the said destroyers. Torpedo Attack Scores - In the interests of consistency I will make these a 4, 5 or 6 for a single hit with the 6 being a hit plus a re roll. Ship Speeds - This is a little problematic during the era covered because the speed disparity between ships of the same notional type could be quite large. I am considering limiting the maximum move to 4 hexes. Timing of Torpedo Attacks - I am considering splitting combat into gunnery then torpedo attacks with gunnery damage being applied BEFORE torpedo attacks take place. This should curb any kamikaze destroyer attacks as the DDs will have to run the gauntlet of enemy gunfire whilst getting into position to launch their torpedoes. By and large then the game ran very smoothly, albeit very quickly and so I am confident that I am on the right track. The relatively minor 'tweaks' should be easily incorporated (and I shall do so over the next few days) and so I will run a further playtest to see how they work out. The apparent focus on destroyers and torpedo attacks is really just a matter of fine tuning as whilst I had ensured that larger ships have to pay them all due respect I had overlooked the fact that destroyers also had to reciprocate this! I decided that this evening should be given over to the first play test of The Portable Naval Wargame rather than painting as these rules have become an itch that needing scratching! Seriously though, I was unable to contain my excitement any longer and so this evening I set up an 8 x 9 Hexon playing area, dragged out the 1/3000th Turkish and Black Sea Fleet Russians and set to with the following action. Yavuz Sultan Selim (BC), defensive combat power (9), offensive combat power (8), secondary allowance (4), torpedo allowance (1) and a speed of 4. Midilli (LC), defensive combat power (4), offensive combat power (3), secondary N/A, torpedo allowance (1) and a speed of 4. Muavent-I Millye x 2 (DD), defensive combat power (2), offensive combat power (1), secondary N/A, torpedo allowance (2) and a speed of 4. Impetrica Marija (BB), defensive combat power (8), offensive combat power (9), secondary allowance (4), torpedo allowance (1) and a speed of 3. Kagul (PC), defensive combat power (3), offensive combat power 4, secondary N/A, torpedo allowance (1) and a speed of 3. Bespokoiny x 2 (DD), defensive combat power (3), offensive combat power (2), secondary N/A, torpedo allowance (3) and a speed of 5. The Russian were travelling from the northern edge of the playing area with the Turks coming from the south. Turn 1. The Russians won the initiative rolling 7 against the Turkish 2 and so the Turks were made to move first. The Turks kept in a fairly compact formation with the cruiser in the van and the destroyers to the rear of the battle cruiser. The Russians however were content to keep there own heavy metal at a distance with the cruiser whilst the two new and powerful destroyers headed off at top speed to engage the Turks with torpedoes - with which they were very well equipped. The two big ships opened fire with the Russian scoring a single hit whilst the Turks failed to register. The Russian Offensive combat factor of 9 was the same as the Turkish defensive combat power and so the dice roll was a straight d6. The score was 6! This meant that one point of damage was scored with the chance of another (a 6 brings a re roll). the second was a 3 so the Russians had to be content with a single hit. the Turkish reply was also at evens - 8 versus 8 - but the dice roll was only a three so no effect. As no other ships were in range this concluded the turn and the white marker on the Turkish ship was solemnly converted to a black one. The end of the turn looked something like this. Turn 2. The Turks won the initiative with a roll of 10 to the Russian 7 and so the Turks opted to let the Russian move first. This was to prove to be a major mistake. The Russian dreadnought continued to lurk at long range with only the cruiser to keep her company whilst the destroyers steamed in to head the Turkish formation off as a prelude to a massed torpedo attack.Although fast the Turkish ships were unable to take sufficient avoiding action but instead counted on the firepower of the cruiser, destroyers and the secondary battery of the battle cruiser to rectify the unfavourable tactical positon they found themselves in. The Russian dreadnought was able to inflict another hit on the Turkish battle cruiser (remember that her defense was now at 8 due to her previous hit yielding the Russian ship a +1 modifier) - heavy damage but nothing fatal. The Russian destroyers though, were about to take centre stage. Two salvoes, each of three torpedo rolls were launched at the Turkish flagship. the scores were 1, 2, 3, 5, 6 and 5 which inflicted 4 hits (meaning the ship was reduced to 3 points remaining!). The two ships paid for their boldness with hits being scored from the cruiser (rolling at evens and a 5 scored) and two rolls at -1causing 4 hits - two rolls of a 6 followed by two rolls of a 5 -from the Turkish destroyers. Incredibly, the Turkish flagship chose to fire at the Russian dreadnought and manged to score a hit with a roll of 5 (the roll was at evens). There you have it - the first test of the Portable Naval Wargame and it appeared to work pretty well. I will detail my thoughts and observations in the next post as I need to go away and digest the content! With the way things have gone today I can only say what a great investment my netbook has been! I was able today to finalise the first draft of the Portable Naval Wargame rules and tidy up the inevitable ship specifications and so I am reasonably confident that the system will be good to go for the playtest. Initially I had planned to go for a one-on-one type of affair but am now leaning more towards having a couple of ships a side and of varying capabilities. I shall give this some further thought before the weekend. The one thing that did strike me though is that, inevitably, the system could be extended into WW2 but that obviously a provision would need to be made for aircraft operations. I have a number of ideas for this which I will detail in due course but for now the priority is to get the core surface ship combat mechanics nailed down before I start thinking about such things as carrier strikes. As for the rules themselves it struck me how by changing the combat system to something much simpler to use so much of the previous game system (I am referring to my earlier sets in this respect) was now redundant. The combat rules in the Portable Naval Wargame barely cover a few paragraphs whereas previously pages would have been used! The system is very simple to use works by simply deducting the current defensive combat power from the offensive combat power being used against the target. This will yield a figure that is applied to the roll of a d6. The resultant final score is then compared against the hit chart and the appropriate number of hit markers are placed alongside the ship (ore recorded on some paper if need be). That is it. The offensive combat power includes an allowance for secondary weapons and torpedoes if applicable. I say allowance because this is not a separate factor - it is a part of the offensive combat power. For example, a ship has an offensive combat power of 8, with a secondary allowance of 3 and torpedoes of 1. This means that the ship could use all 8 points (subject to firing restrictions due to the target type) against a target or, it could use up to 3 points as a secondary factor leaving 5 to use elsewhere. I have adopted this technique for a simple reason. I believe that if a ship is close enough to a target to need to use its secondary weapons then the quality of its main weapons fire will be degraded as the nearer target (presumably carrying torpedoes!) will have a much greater level of attention being paid to it. It means that the historically valid tactic of using a destroyer attack to disrupt an enemy battleline will have the same effect on the playing area. This will encourage players to ensure that the battleline is adequately protected so it can continue function in the role for which it was intended. The number of offensive combat power points assigned to combat also determines the maximum range a ship can engage at which means that battleships need to be kept at a distance in order to gain the maximum benefit of their weapons. The defensive combat power is basically the number of hits a ship can sustain before being sunk and the combat mechanics mean that as a ship takes damage then the easier it is to damage her further as the firing modifier will increase in real terms. The rationale behind this is that the ship will gradually sustain more damage than can be coped with and so additional damage would then be proportionally more effective. All will be clear when I run the first playtest (all being well over the weekend) which, as usual, I will report on the blog. I am quite excited about the potential of this set - not least of which because I have finally managed to draft a set of naval rules that fit onto two sides of A4 paper and not in 'bible print' either! Above are the seven completed City class ironclads for my ACW collection. They have now joined up with their squadron mates - Benton and Essex and are poised at the ready to wrest control of 'the great Father of waters' from the accursed Rebels. The funnels bands were printed on sticky labels and then applied by hand with a coat of matt varnish to help seal them in. The Baron de Kalb was first known as the St. Louis but when the US Navy took control of the river fleet she had to have a new name as a St. Louis already existed with the fleet. The Cairo was sunk by a mine but was raised in the early 1960's and is on display in Vicksburg. 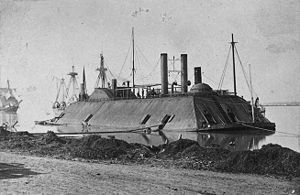 USS Cairo in her final resting place. Carondelet was the vessel that successfully ran the Confederate guns on Island Number 10 at night. I am pleased with the way these have come out as they were built in three batches because first of all I was only going to build 3, then I added another (to accompany Benton and Essex) and finally built the remaining three when I decided that the whole collection needed expanding (and with a view on my future river-based campaigns). That concludes the pure ironclad phase of the project as the remaining 32 vessels are a mixture of cotton, timber and tin clad vessels with three semi-ironclads thrown in for good measure. The next batch will be of 16 models - 8 for each side - and comprises a mix of rams and gunboats. The final batch will contain the 'walking beam' types (4 of those), the Union timberclads and semi-ironclads and whatever else is left. The first two of the current batch of nine models are now finished and so I would like to introduce the USS Benton and the USS Essex. 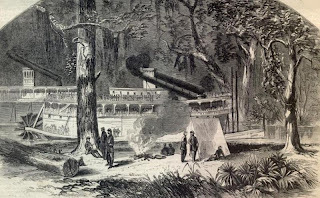 Their squadron mates - the city class gunboats - are currently awaiting their funnels bands and then they to will be able to challenge the Rebels for control of the Mississippi. I used a much darker grey for the metalwork - Humbrol Matt 79 - which will also be handy for the early war German vehicles for Operation Barbarossa when I get around to that (next year!). I have black washed them and dry brushed some Games Workshop Bolt Gun Metal on the casemate angles and gunports. I am rather pleased with these, especially the Essex as I had to carve out the rounded section of her casemate and it came out pretty well. Benton is big and she looks very imposing alongside the rest of the squadron although she was slower than all the rest (but "Plenty fast enough to fight with!"). The city class will on the blog tomorrow - I have cheated slightly with these as I had a change of heart in connection with the funnel bands. These are now printed off on sticky labels with the correct colours and will placed rather than painted. Readers of this blog will no doubt recall all the trials, tribulations and agonising I have gone through over the last couple of years trying to design a set of grid-based naval wargames rules. After much work, numerous blind alleys, the odd flash of inspiration and a series of spectacular headaches I managed to produce a DBA based variant, a Morschauser inspired set (that is being very generous as just about the only thing the rules had in common with anything Morschauser related was in the use of a square grid!) and most of a Memoir 44/Battle Cry based set - of which Bob Corderoy's version(s) were far more complete than my own efforts. The work that went into this sets was both interesting and thought provoking and I learned an enormous amount from the process, ably assisted along the way by the inexhaustible patience of numerous members of SEEMS and the comments and observations from the blog universe. I cant help feeling that my efforts thus far have swung a little too far from what I had set out to achieve in the first place - devising a non-record keeping set of grid based naval wargame rules of a level of detail and complexity that could sit alongside of, and to share a common game mechanic background with Jo Morschauser's systems for land warfare. I suppose my question then is very simple - if Jo Morschauser ever designed a naval wargame how would he have done it? For me, the concepts behind the Portable Wargame are absolutely 100% in line with my own gaming aspirations - they are simple yet challenging to use and are equally at home being used for solo play or for a club night knockabout. Above all though, they 'feel' right for the period under consideration and are robust enough in design to be able to cope with any amount of 'tinkering' for sub-period or scenario specific reasons. This is exactly what I would want from a naval version as I really like the idea of gaming across land and sea (and air?) using rules that are of a common background. Impossible? I don't think so but it would certainly require something of a leap of faith to achieve as, for the most part, naval game rules tend to work on a different basis to land rules and rightly so. What does all this mean then? I am thinking that if I want to achieve this level of rules homogeneity then I will need to undertake drafting a set firmly camped in the Morschauser universe as these are my preferred choice for land games. This is further complicated by the fact that I would need three such sets - Ironclads (for the ACW), pre dreadnoughts and 1905 plus. I am convinced however, that a core set of rules could easily be used up and down the timescale with the tweaks applicable as and where needed for period specific features. Much to ponder methinks - and many lunchtimes grafted to my netbook! "I still haven't found what I'm looking for...."
Tired, frustrated and tetchy with it - still not an ideal frame of mind to be painting with so tonight's session with the paintbrush has been canned. Work has been contriving to grind me down and thus far it is working very well as for the second day running it has been fairly intense and draining. Still, I have a number of wargaming chores to attend to that are important in their own way so the time will not be wasted. I just don't seem to be able to get motivated to paint which is odd as I really want to get on with the ACW ships. Perhaps a glance through Jack Coombe's book 'Thunder Along the Mississippi' will get the creative juices flowing again. You know how it is. You have a couple of busy weeks where you seem to be running around like the proverbial headless chicken with little or no time for anything practical (I know, I went to Duxford and Sittingbourne and whilst they were enormous fun it meant I was not painting or anything similar) and just when you are in the position to tackle the said practical task something else crops up out of the woodwork to scupper your plans. In my case it was work today. A systems upgrade at work over the weekend meant that I was delayed by some three hours this morning in that it was three hours before I could start my daily round. By virtue of skipping lunch and working like a beaver I was able to get away at a sensible time but am now feeling so drained that any thoughts of painting this evening have gone out of the window. It would not be so bad if it was just the 'slop-it-on-and-try-not-to-get-too-much-over-where-you-don't-need-it' but I am at a fiddly stage on the current batch of ironclads and so the need for precision is paramount. This is not a job to tackle when tired (at least it is not for me) and so I shall postpone the session until tomorrow. Instead I have a couple of gaming related chores to attend to - printing off some rules and making a couple of lists so I shall tackle these as an alternative to my original plan. Less productive perhaps but at least the evening will not be entirely written off! I spent a very pleasant morning at this new show in Sittingbourne, Kent organised by the Milton Hundreds Wargames Club. The venue was split into two separate halls with a mixture of games and trade located in each. I shall refrain from listing all the trade and games in attendance for no other reason than they are all really well laid out on the clubs website http://www.mhwc.co.uk/ so you can check them out for details. I set out to arrive before opening as I had a pile of 'kit' to deliver to one of the traders and to also collect the same from one of the others. This was duly transacted and so now I am the proud owner of a pile of Zvezda Art of Tactic Operation Barbarossa kit which will form next years project. Bob Cordery reviewed the same earlier in the year and so check out his (excellent) blog http://wargamingmiscellany.blogspot.com/search/label/Art%20of%20Tactic for details of what is in the box. SEEMS http://seemswargamesclub.blogspot.com/ were in attendance with Mr Fox running a 1/1200th Napoleonic Naval game based on Hothams Action in 1795 and pitted the RN against the French with Nelson commanding the Agamemnon (64). The picture below shows the action at the outset. I should point out that the pictures were all taken at the outset of the respective games so if not a lot appears to be happening that will be why! There was a good variety of trade present with such well known names as Brigade Models, Harfields and Tumbling Dice and a host of others (again, all listed on the Milton website - just follow the link above). I managed to pick up a couple of books from David Lanchester - one of which I owe thanks for to Conrad Kinch and his excellent blog http://joyandforgetfulness.blogspot.com/ in which recent entries have described Mark Urban's book 'The Man Who Broke Napoleon's Codes' as being well worthy of attention for the budding Peninsular War gamer (especially using Command and Colours: Napoleonics!). This was duly acquired for £5. I also picked up (from the same source) a copy of David Glantz's book 'After Stalingrad' which covers the Red Army winter offensive after the German defeat. This is a little later than my Barbarossa kit but is well worth having simply because he is such a leading authority on the subject. The following are some of the games that caught my eye whilst wandering about. 'Where the Poppies Grow' - the first in the CRUSH THE KAISER series of fast play brigade level wargames rules for the First World War coming from CTK Productions. The rules should be available fairly soon. There was also a DBA tournament being run and a number of sci-fi skirmish type games (Space Vixens was one of them!) as well as a huge Warhammer 40K game that reminded me of a cross between Stalingrad and Helms's Deep! I only stayed for the morning but thoroughly enjoyed my time in Sittingbourne. I met up with Bob Cordery during his flying visit and also with my old wargaming friend from my schooldays. Mercifully he was too modest to remind me of the continual beatings he used to give me using our Airfix plastic Napoleonics and Bruce Quarrie's rules! I always managed to beat him at Waddington's Campaign though so perhaps that evened things out a little! All in all the MHWC chaps put on a very good show and I hope that it was as successful as they had hoped and that it will feature on the calender for next year. Tomorrow sees the first wargames show organised by the Milton Hundreds Wargames Club at Sittingbourne, deep in the heart of the garden of England - Kent. Yours truly will be there, armed with his wallet and a camera and is not afraid to use either! SEEMS are putting on a Napoleonic Naval action using the superb models from Mr Fox's collection and indeed, he is the driving force behind the action on the day. If you are going then please swing past and take a look - the models are really top drawer. A report on the days events will follow (well half day really as I am only there until early afternoon!) with some pictures probably tomorrow evening and it is safe to say though in the meantime that I am really excited about this - I need to get out more methinks! Two hobby related days out in one week - whatever next!? As mentioned earlier in the week yesterday saw SWMBO's brother and myself head up the M11 to Duxford for the day - and what an excellent visit it was! Despite spending the best part of the day there we still did not manage to see everything (we had to miss out the 1940 Ops Room and the entire Air/Sea hall - so sadly no chance to stroke the Tirpitz....) but we had a great time anyway. The place is huge - I had forgotten just how big - and is continually evolving in respect of the collections housed there. A good example of this is the Airborne Assault display located in the Air/Space hanger, tucked in behind the Lancaster bomber. The collection was moved from the now closed down Airborne forces museum in Aldershot and it turns out that a good chunk is still in storage so this will expand in time. As an ex- paratrooper SWMBO's brother naturally wanted to see this first and so despite the small size of the display we manged to spend over an hour looking at the selection of Airborne memorabilia - from their early days up to modern day Afghanistan. The medals collection is very impressive with numerous VC's on display - both from WW2 up to the Falklands conflict. I was particularly taken with the uniforms and decorations of Col. John Frost of 2 Para at Arnhem Bridge fame - the display even included his famous hunting horn. There was also a display of items from both the Radfan and Aden campaigns which was of particular interest as SWMBO's brother saw action there. One of the items on display was a shattered flash eliminator from the end of an SLR. SWMBO's brother was in the firing line alongside the lucky recipient of this souvenir when it happened - I say lucky because a millimetre either side and the chap in question would not be here today (he still is). A number of ex servicemen serve as volunteers at the museum and on duty in the museum were a couple of ex-paratroopers and so, no doubt attracted by SWMBO's brothers rather distinctive tee-shirt soon introduced themselves and the three of them were soon swapping stories as only ex-servicemen can. It was quite amusing to listen to paratrooping anecdotes although as to me it felt almost like I was intruding at a family gathering! After making our way from the Airborne Assault display we then went to explore the rest of the museum - starting with the Air/Space hall. For the most part many of the exhibits will be familiar to most wargamers with an interest in WW1 and 2 and so I shall confine myself to those oddities or items of particular personal interest starting with the Avro Anson. Unfortunately I could not get the shot showing why this was of particular interest. The Anson was a trainer/liaison/light transport type and so why was this example mounting no less than 6 air-cooled Lewis guns? I don't know if this aircraft was used for air-gunner training so I am puzzled as to why it was carrying so much hardware. Our next port of call was the land warfare display and some old friends made an appearance in the shape of the (in)famous Tiger tank - seen here located snugly in a shop front, no doubt awaiting the opportunity to inflict some damage on the assorted enemy hardware on display in the immediate vicinity (mainly Russian). The Hetzer tank destroyer and friends. A rather shabby looking Stug 111 - although it is going to be spruced up at some point. A Vickers Light tank - and yes, it is that small! I have a few more shots from the Land Warfare hall which will be included in the final part of this post which I hope to tackle this evening. After we had finished up in there we headed to the US air hall and finished up in the Battle of Britain display and they will form the contents of part 2. I personally tend to prefer the smaller show events as they seem to be more intimate and so longer can be spent perusing the games on offer - I have not been to either Salute or SELWG for some years - and so as a result this one is right up my street. There is a personal reason for attending as well as Sittingbourne is where I had my first job after leaving school and is very near to the Isle of Sheppey where I come from. It was in the cinema in Sittingbourne that I first saw both Jaws and Star Wars and so it will be interesting to see the old place again after some 30 odd years. I am also meeting an old wargaming school friend (whom I have not seen for around 20 odd years) at the show so no doubt I will be reminded of the frequent trouncing my 1815 Airfix Anglo-Brunswick army used to routinely receive at the hands of his French! SEEMS - my club - are putting on a Napoleonic Naval action run by Mr Fox who is supplying his most excellent models, rules, the scenario, god-like umpirical observations and technical know-how and adding a little tone to what would otherwise be a vulgar brawl. To anybody going to this event please drop by the SEEMS stand - the models looks so realistic you need to be inoculated against scurvy to use them - to take a look and if you happen to see me lurking about staggering under a pile of WW2 Russian Front kit feel free to stop me and say hello! Above is a picture of the complete village I now own of ceramic Greek/Balkan style buildings. I was very pleased with the six models I acquired whilst away to complement the existing buildings - I suspect they are manufactured by a single company - and I probably will not need to add any more. Geographically and architecturally they are probably best described as Balkans non-specific which means they are ideal for my project. I was also pleased with the fact that the buildings fall nicely into urban and rural types - the smaller buildings and the very nice church complete with the poplar tree are ideal for the latter and the larger for the former. Now for the trees - poplars and conifers with some others thrown in for good measure.